This story is one of the unhappy stories I had while at DLNR. We were dealing with the last of its kind – so losing it had a different, and more permanent, meaning. I hope telling the story will help keep the memory alive. This is not only of personal concern, at the time I was also the State Historic Preservation Officer. Anyway, on December 27, 1850, the Honolulu Fire Department was established, by signature of King Kamehameha III, and was the first of its kind in the Hawaiian Islands, and the only Fire Department in the United States established by a ruling monarch. Back in those early days, firefighting equipment was primarily buckets and portable water supplies. As the department grew, several hand-drawn engine companies were added. In 1870, the tallest structure in Honolulu was the bell tower of Central Fire Station, then-located on Union Street. Spotters would sit in the tower, ready to sound the alarm. Central Fire Station was later relocated to its present site at Beretania and Fort Streets. Until 1901, most business buildings in downtown were 2-3 floors, that year the 6-floor Stangenwald Building was completed; it remained the tallest building until 1950, when the seven-story Edgewater Hotel in Waikīkī took over that title. So, for a very long time, firefighting in Honolulu was handled pretty close to the ground, with buildings essentially accessible via hand-raised ladders. Also, back then, with all the buildings relatively similar in scale, spotting was easy from the towers adjoining the stations and firefighting equipment was pretty consistent to deal with the similar building heights. The old Kakaʻako Fire Station was occupied on October 1, 1929, by Engine Company Number 9. In 1930, a hook and ladder building was constructed. It housed a ladder truck for 20 years. It housed the equipment that transported ladders to the downtown fires. Its size and shape showed the scale of Honolulu’s buildings. The lengths of the ladders on the ladder trucks were tall enough to effectively fight downtown structure fires. Taller ladders were not needed, because Honolulu, then, did not have taller structures. And that’s the point of this story. When the Fire Department was going through its consultation with DLNR’s Historic Preservation Division, I got involved in the discussions when I heard they wanted to get rid of the ladder building. It was the last of its kind (all other ladder buildings (typically attached to the various fire stations) had been removed from the other older fire stations.) Kakaʻako had the last one. And, with a brand spanking new Administration building going up next door, this old building was an eyesore and in the way. We had a meeting with the top brass from the Fire Department – the Chief and his Assistant Chiefs. That building helped tell the story of the other buildings in the area and the look of Honolulu at the time. Well, after several discussions (several of them not pleasant,) we compromised on retaining the facades of the front and rear of the ladder building, with trellising forming the height of the building (trying to give the sense of scale of the ladder building) and tiles on the ground noting the perimeter walls. Unfortunately, during the course of construction, we were belated-told that the facades could not be saved and there was nothing anyone could do about that. I’ve been back to the Station and was happy to see the tiled outline of the old ladder building in the connecting walkway between the Old Kakaʻako Station and the Administration building. 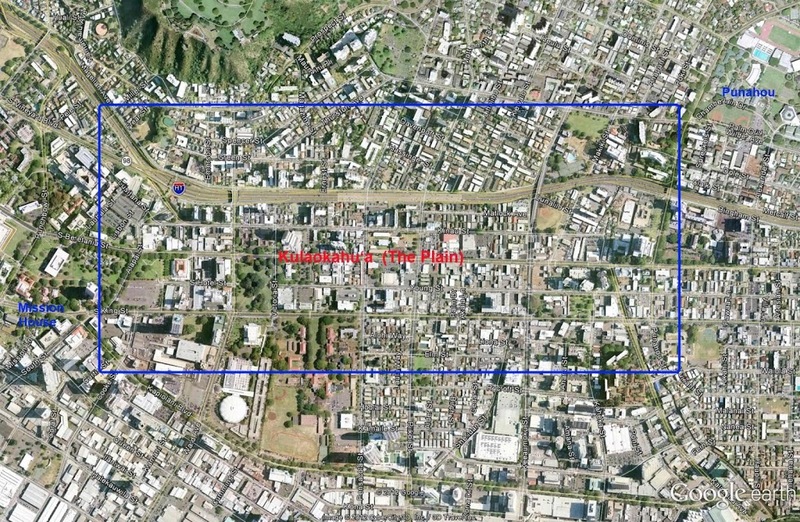 It’s difficult to image that Honolulu was once a low-rise central business district – and was that way for such a long time. Fortunately, we have some representation of what it looked like, told through the tiles on the ground. 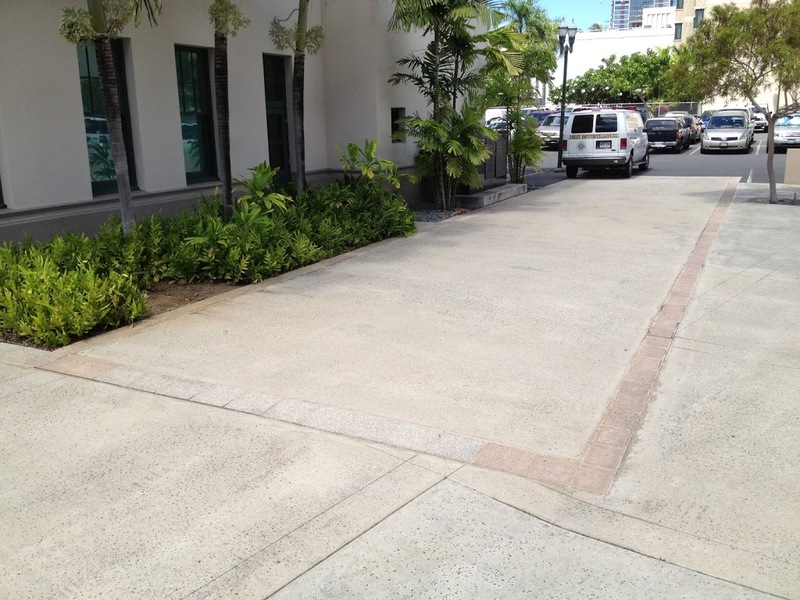 The image shows the tiled outline of the former ladder building at the Kakaʻako Fire Station. In addition, I have included other images in a folder of like name in the Photos section on my Facebook and Google+ pages. Kualoa is an ancient Hawaiian land division (ahupua‘a) at the north end of Kāne‘ohe Bay, windward O‘ahu. The ahupua‘a extends from the coast to the top of the nearly vertical, fluted mountain behind. The area of Kualoa Regional Park has been modified in the past as a result of different land uses. Prior to World War II the lands were part of the sugarcane plantation of Kualoa. The lands were converted to a fighter airfield during the World War II period, and reverted to grazing use after the war. 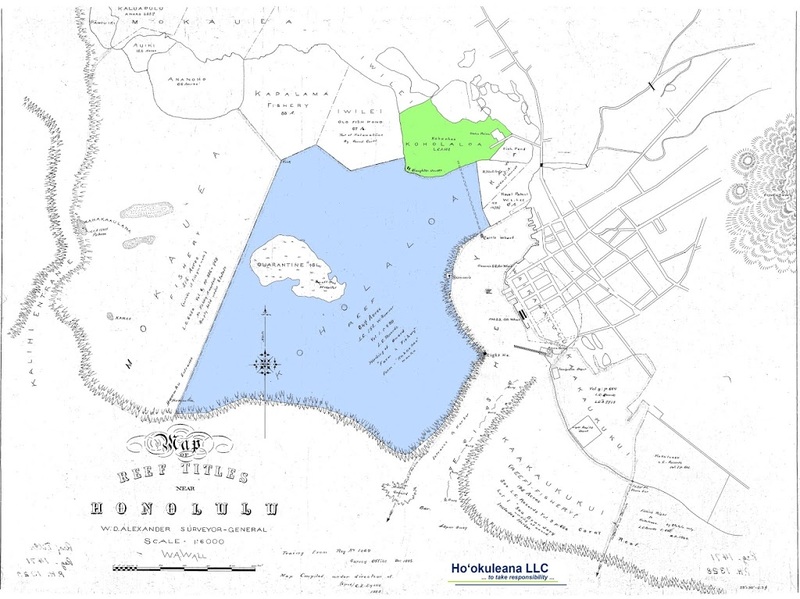 The City and County of Honolulu condemned the land in the 1970s and converted it into a park. Behind the beach at Kualoa Beach Park and running into the Kualoa Ranch property was a temporary facility used for a World War II airfield. Kualoa airfield was evidently constructed during the early portion of WWII (maybe around 1942) and probably used as a satellite field for units assigned to Bellows Field, and was used mainly for training. 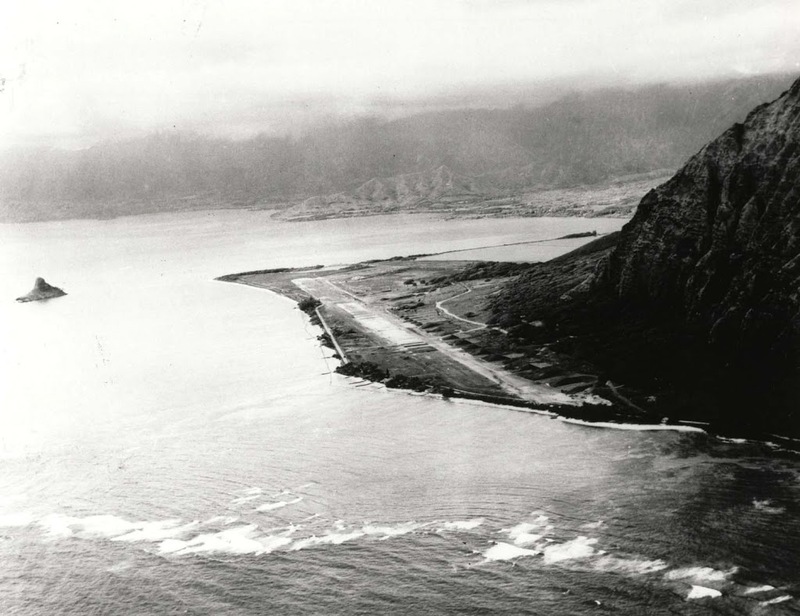 The earliest depiction of the field which has been located was a May 10, 1942 photo of Kualoa Field, which showed the field as having a single north/south runway. It was depicted as having a single 6,500′ (north-south) runway. No evidence suggests that Kualoa was ever paved. The entire runway was formed of pierced steel planking. The steel planking makes a strong case that the military had no plans to keep Kualoa open any longer than it was needed. The road to Ka‘a‘awa and farther up to the north shore crossed over Kualoa’s runway, so the cars would have to wait whenever an airplane took off. A row of revetments for protected aircraft parking was along the west side of the runway. Several fortified bunkers for coast artillery batteries were constructed in the cliffs overlooking Kualoa Field during WW2. The 28th Photographic Reconnaissance Squadron, operating P-38, F-4 and A-24 aircraft was stationed at Kualoa between October 9, 1944 and May 8, 1945. The 18th Fighter Group, operating P-40s, also was stationed there briefly. Since Kualoa Field had been constructed on land that was not owned by the military, it was returned to its original owners after WW2. The image shows Kualoa Airfield in about 1942. In addition, I have included other images in a folder of like name in the Photos section on my Facebook and Google+ pages. Pōhaku or stones are believed to hold mana or spiritual power. Pōhaku are featured in shrines as manifestations of ʻaumakua (family guardians,) akua (deities) and ʻuhane (spirits.) Throughout the islands are famous and named pōhaku which figure prominently in healing and health. Kapaemahu was the leader of the four and honored for his ability to cast aside carnality and care for both men and women. Kapuni was said to envelop his patients with his mana. While Kinohi was the clairvoyant diagnostician, Kahaloa— whose name means “long breath”—was said to be able to breathe life into her patients. The art of healing they practiced is known in the Islands as la‘au lapa‘au. In this practice, plants and animals from the land and sea, which are known to have healing properties, are combined with great wisdom to treat the ailing. On the night of Kāne (the night that the moon rises at dawn,) the people began to move the rocks from Kaimukī to Kūhiō Beach. During a month-long ceremony, the healers are said to have transferred their names — Kapaemahu, Kahaloa, Kapuni and Kinohi — and or spiritual power, to the stones. It was not until the first decade of the 1900s that Gov. Archibald Cleghorn discovered two stones on his property and two on an adjacent property. Recognizing their significance, Cleghorn had them excavated and placed together on his estate with the stipulation that they should not be moved. Then, in 1963, they were relocated to Kūhiō Beach. In 1980, the stones were moved again, approximately 50 feet mauka (toward the mountains) from their 1963 location. For years, committed individuals collaborated on plans to create a wahi pana (sacred place) where Na Pohaku could be honored and protected. 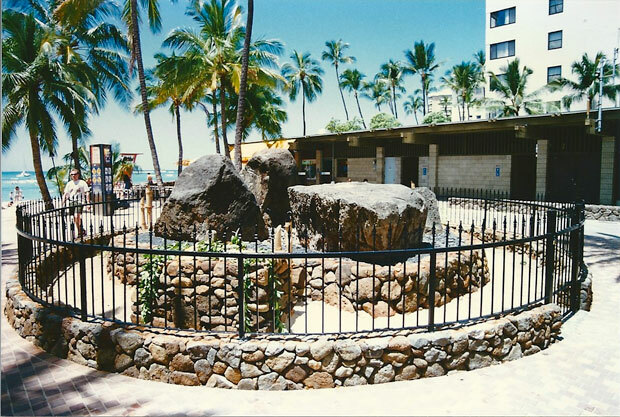 This wahi pana (or legendary site) was restored with the Assistance of Papa Henry Auwae and the Queen Emma Foundation 1997. In addition to the many involved with the restoration, a delegation from Tahiti was present for the final ceremonies. These individuals blessed the stones with wild basil, traditionally used for cleansing, and presented a small stone from Tahiti named Ta‘ahu ea as a ho‘okupu (offering). That stone is now set on top of the altar in front of Na Pohaku. Following the direction of Papa Auwae, four plants with medicinal value were added to the site—ma‘o (Hawaiian cotton), ‘ohe (bamboo), makahala (wild tobacco) and naupaka kahakai (beach naupaka). The image shows Na Pōhaku Ola Kapaemahu A Kapuni. Lots of information here from Karyl Reynolds. In addition, I have included other images in a folder of like name in the Photos section on my Facebook and Google+ pages.